Hallo girls Charmy has a big problem, last night she had some friends over to celebrate her sixteen birthday. The problem is her parents are out of town, they are on a shopping trip in Paris. But today they are coming back home! And now Charmy got some time left to clean up everything in the house, it’s a big house and all rooms are a real big mess. Since the house is extremely messy, she won’t be able to complete the task on her own, even if she would work for the entire day. So can you give her the extra helping hand so she can easily finish her task in less tim! So pitch in and lend a hand for this big clean up job. Tidy the rooms and a things in the house from the living room to the bedroom. 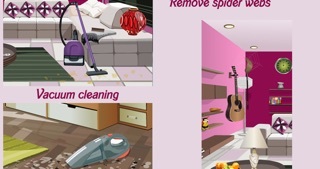 We hope you will enjoy our free clean up room decoration girl game, and we hope you give us the love by likening our Facebook page or follow us on twitter. So we can keep you up to date on our fashion games, girl games, hair salon games and more!